Resembling fighter jets soaring into the sky, the 17-spired Cadet Chapel on the campus of the Air Force Academy is the most recognized building there and is often used as a symbol of the Academy itself. One hundred identical aluminum tetrahedrons rise 150 feet separated by colored glass. Controversial for its design when it was first built, it is now considered one of the best examples of modern American academic architecture. Completed in 1963, the 2-level chapel was designed by Architect Walter Netsch for the school in Colorado Springs, Colorado. The stated mission of the Air Force Chaplain and the Cadet Chapel is "to inspire men and women to become leaders of character by providing spiritual care and facilitating the free exercise of religion." 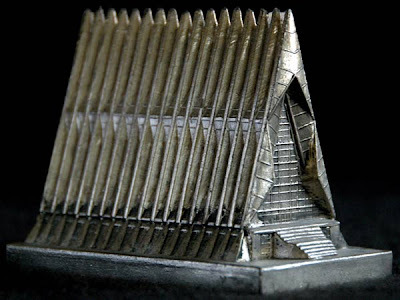 The metal souvenir building replica pictured here is from the 1960's and measures 3” tall x 3.5” long. A newer, smaller pewter version was also produced.